The idea of “local” has changed significantly, or at least has been significantly blurred, as the Internet has risen to such powerful stature in our modern society. A cupcake that was baked this morning at the cafe down the street from you is local. A newspaper about your city, printed in your city, that’s local. Just about everything Farmer Joe is dealing in at the local farmer’s market is local. But there have always been blurred lines. Is a cup of coffee brewed in Austin really local, given that the beans to make it were grown in Guatemala? For those of us who travel full-time, local is additionally difficult to pinpoint. We can buy locally, but we aren’t really locals, except that we are, just for a much shorter time than usual. We typically make our living in a non-local way: some type of Internet gig. Enter thirty-somethings Lauren and Travis Hardy, two traveling mercantile proprietors who take everything above, stuff it into a 19′ 1963 Airstream Globetrotter, and more or less redefine the term “local” once again. Though their meandering boutique on the road is one of the smallest you might ever visit, it also serves part time as their home. And a music venue. And a dog house. A lot done, with quite a little. It was this seemingly impossible combination of stage, gallery, boutique and three living things existing within one of America’s most iconic (and compact) vintage trailers that has had us scratching our heads with delight ever since we stumbled across their Instagram account. Travis transitioned into his adult life as an Industrial Design student at Georgia Tech. He now boasts the phantasmagorical title of Creative Conductor, no doubt lending both to the navigating of the vessel which lugs their Airstream around as well as his duties with the store. Lauren wears many hats, not the least of which originally providing them the ability to travel around full-time. 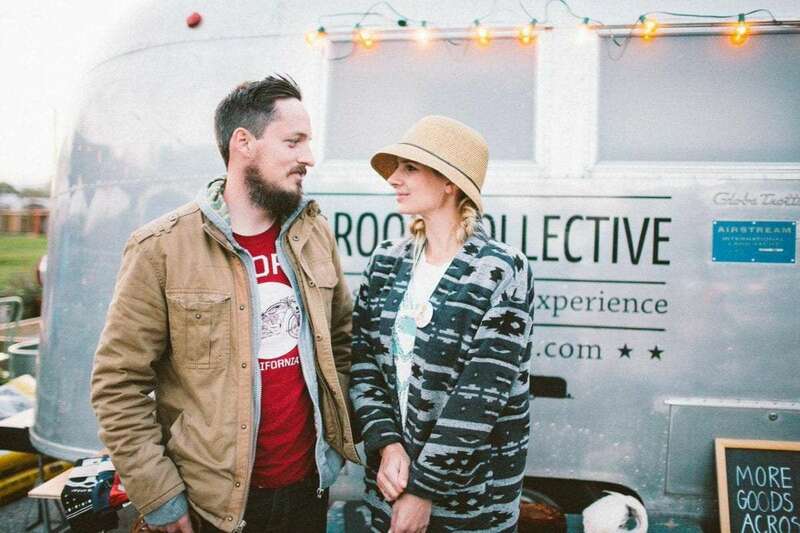 Together–Airstream, pooch and all–they are Small Room Collective. “We left Austin in September of 2011,” recalls Travis, “to pursue a traveling life with Lauren’s other vocation–a short-term contract traveling pediatric oncology nurse.” Traveling nurses are some of the original “non-Internet” people who discovered that they needn’t keep the same ZIP code in order to keep the same job. “In each place we moved we met so many cool people in each spot, and when we got to the next spot we’d find others. So when Lauren wanted to take a break from oncology we decided to just focus on being the connecting piece of all the places and people we’ve met. We thought we’d buy a trailer and travel around the USA, carrying her vintage, meeting new makers, and connecting them with our next stops. So within less than a year of having the road emporium idea we searched for a trailer, bought it, built it out and set out for full time road life.” That was in 2012. Small Room Collective in “shop” mode. Photos provided by Avenue for the Arts, WD & Sandi Gunnett Photography. Is it possible to run a little shop like this and keep yourself afloat? Certainly a typical bricks-and-mortar store faces hardships trying to keep any particular business going all year long, one could easily assume that perhaps the complications of constantly shifting your address would make such an endeavor even more difficult. 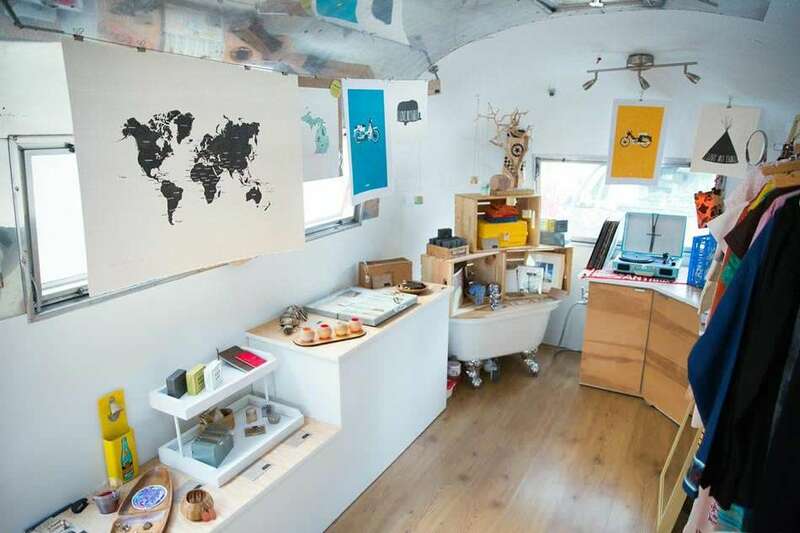 One of the most beautiful things about Small Room Collective is how they’ve found a way to combine selling physical goods and traveling full-time, eschewing the typical “all day Internet, every day” income so typical of this lifestyle. “Well, somewhat true,” Lauren admits that the Internet is not completely irrelevant to their pocketbook. “Travis still does independent design work, so when we’re moving he’s typically working.” What loose ends Travis’ work and the shop leave needing tied, Lauren fills in with her nursing skills. “I also work a contract at a hospital once a year so we can keep the Airstream wheels rolling,” she tells. They’re not alone in finding interesting ways to keep the odometer climbing. It’s not as carefree, perhaps, as most aspects of the traveling life. You can’t just setup in a campground or open shop in some random city park. Most places have regulations, permits, red tape. Plus, unlike turning a key and throwing on the neon “Open” sign, Small Room Collective has to setup shop–literally–over and over again. A peek inside. Photo by Ryan Kulp, Colorado Springs, CO.
“There’s no big magic trick here unfortunately,” Lauren is speaking to the actual task of converting their house, regularly, from mobile home to a small shop to their actual living space. “We break down and set-up for each event. We have a shop-ready version, and a road-ready version. We use a system of bins plus crates for storage, and some of the crates are also used as displays. It’s taken some practice balancing set-up/break-down time with making things secure for the 7.8 magnitude earthquake the trailer goes through every time it goes down the road.” The secret to all of this? 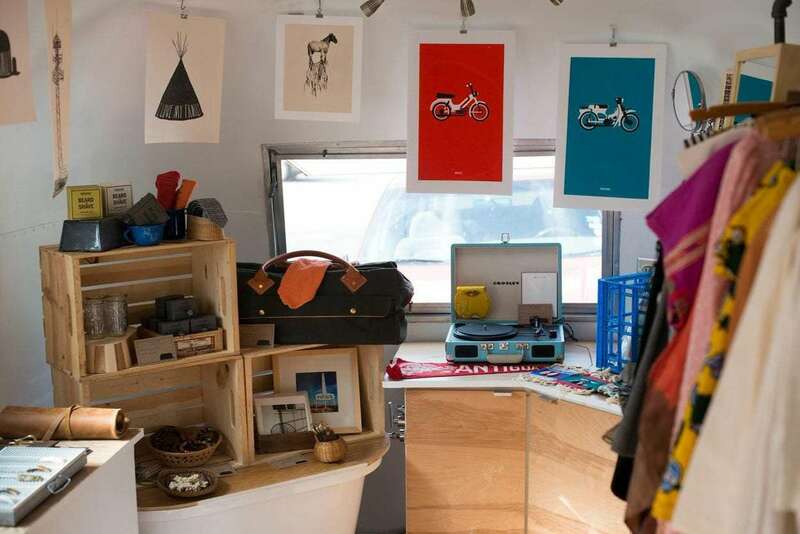 So how might a mobile mercantile find where they’ll be able to setup shop next? Be sure to check out Small Room Collective online, and we personally love following along with they and their wares via Instagram.